How did mid-February creep up on us? I'm not really sure. What I do know is that I don't take much stock in Valentine's Day. It's fun for the kids I work with, but that's really the extent of celebration around here. So, like last year, I decided to make handmade valentines for my class - just without sewing this time. It's so fast and easy! I created a quick cardboard heart template, traced onto fabric, cut them out with pinking shears, and glued them onto scrapbook paper. There's plenty of room to write "to" and "from," and they have that handmade touch. No sewing needed! I hope the kiddos like them. It was fun to pick out colors and fabrics for each child, based on what they like. That's the best thing about working at a school: getting to know the kids so well! Despite our general non-celebration of Valentine's Day, I like to give my husband a mini mini quilt for holidays, and once the idea popped into my head, I couldn't pass it up. This is Baymax, the main sidekick from Disney's Big Hero 6. If you haven't seen the movie before and you like animated movies in general, you should definitely watch this one. It's absolutely hilarious. 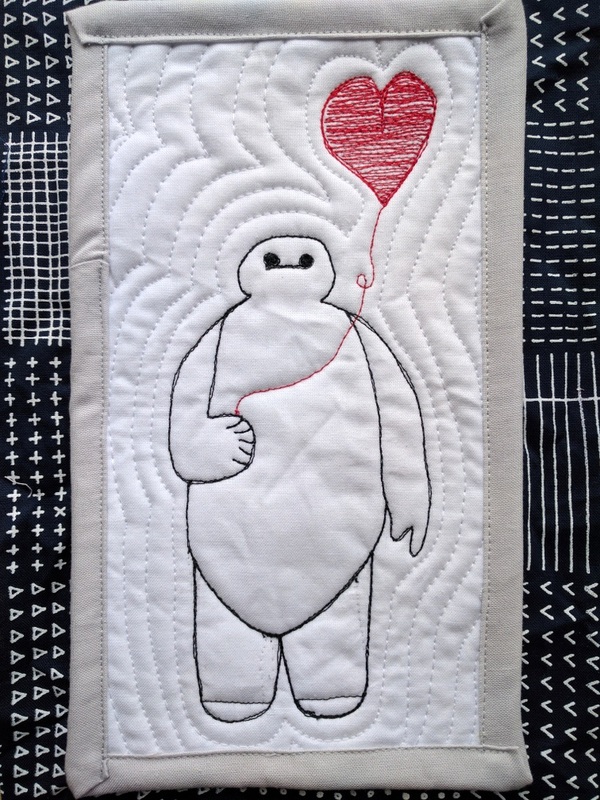 Anyway, we love Baymax around here, and somehow I envisioned him simply holding a heart balloon. I drew him freehand onto the white fabric (not without incident - you can see where I had to fix his legs - the darn needle holes show up too well on white fabric). Then, I traced/sketched around him a couple times with my free motion foot, and filled in a balloon. Whenever I make one of these for Mike (I haven't posted them all to the blog), I add a little message on the back, echo quilt around the middle, and bind in gray. In case you celebrate Galentine's Day with the ladies in your life (Feb. 13), Alison of Little Bunny Quilts whipped up a cute mug rug quoting Parks and Recreation (where Galentine's Day originates from, as far as I can tell). I happen to love Parks and Rec with a thousand hearts, and I know some of you do, too. What have you made for Valentine's Day in the past? and Needle and Thread Thursday. The quick fabric heart Valentine's you made are so cute! I love the Valentine's cards and the mini mini quilt. All very creative! These are really cute. I should get started on next year's valentines. I do not watch "movies" usually, but I will check this movie Big Hero. Maybe it will be something interesting. What a sweet idea for your class! 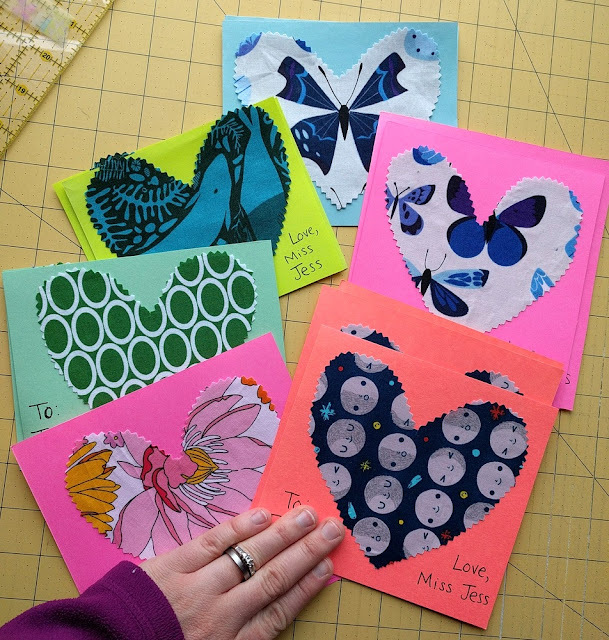 I think the no sew cards are such a great idea and I'm sure they loved them! As for your mini...way too cute!